I searched the Internet in vain for a decent photograph of black-grass (Alopecurus myosuroides). The flowerheads are usually green (most of the photos show this) but especially when immature may also be a striking purple-red colour. This dries to black and, I used to imagine, accounts for the common name; but according to Dr Stephen Moss, (who ought to know best), it's a farmer's term referring to the dark patch in a wheat field that indicates heavy infestation from a distance. What makes the flowerhead look much more like a tail than e.g. Meadow Foxtail (Alopecurus pratensis) is the way it tapers towards the tip. Strictly speaking myosuroides means “like a mousetail”, i.e. the now rare plant Myosurus minimus which of course itself looks like a mouse’s tail. In Spain the common name is “cola de zorra” (vixen’s tail) and in Italy “coda di topo dei campi” (field mouse’s tail). The other thing that’s striking about black-grass is just how closely the flowerheads are massed together in stands of many individual plants. That sight should be a real inspiration to proponents of intensive farming (which de facto means all of us and our hungry, prosperous, city-sprouting,sandwich-munching ways). What we do well, black-grass does better – at least, it does better in the particular ecological conditions that we’ve created. The lack of on-line photographs may actually have more to do with how farmers hate the very sight of it. If black-grass is not the most written-about wild plant in Europe, it is certainly the most urgently written-about. 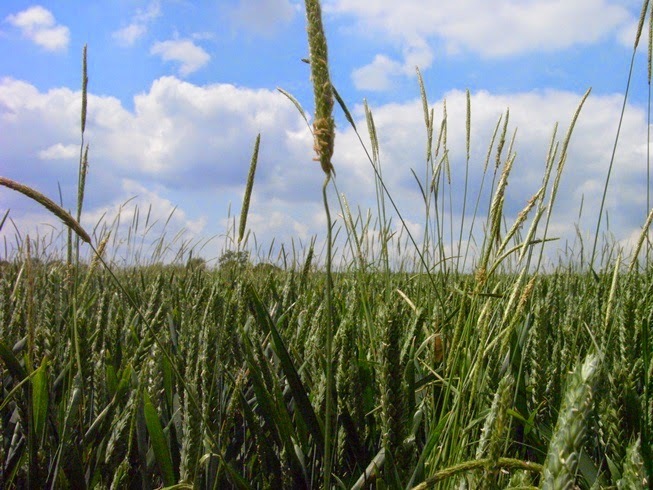 Black-grass is a noxious weed of winter wheat – principally autumn-sown wheat, which is grown by more intensive methods than spring-sown wheat. The combination of new growing cycles, high doses of nitrogen and methodical application of herbicides has eliminated many traditional cornfield weeds but the new method has produced an explosion of cleavers (Galium aparine), barren brome (Anisantha sterilis) and black-grass. The others are common plants everywhere but black-grass was once localized – in the UK, it was only common on heavy soils in SE England. It has spread widely with the winter wheat methods and can now be found e.g. on chalk downland. (It is also common throughout temperate Europe and Asia and is established in eight states in the US.) The timings of autumn-sown wheat suit it perfectly. It germinates in the autumn, easily out-competes the crop in spring growth and sheds its very numerous seeds well before harvest in July/August. A modest 12.5 seedlings/m2 has been calculated to mean a 5% crop loss now, but action must be taken when the level is only 5 seedling/m2; if not dealt with that can mushroom to 500 seedlings/m2 in a couple of years and a >40% crop loss. Margins are low for wheat-growers, and these are not nice figures. Every farming method has its own weeds but the current interest in Black-grass derives from its development of resistance to herbicides. It’s winning the war, and the Weed Resistance Action Group (WRAG) (industry stakeholders) are extremely concerned (http://www.pesticides.gov.uk/rags.asp?id=714). Black-grass can develop two modes of resistance, enhanced metabolism resistance (EMR) and target site resistance (TSR) which between them render all the approved herbicides ineffective. Contrary to what outsiders might suppose, the agrichemical companies do not have a magic bullet on the way – herbicides in the pipeline all use essentially the same attack methods and there is no hope that resistant black-grass will fail to match them. The approaches suggested by WRAG are therefore all about mitigation; do what you can to slow down the black-grass on your farm from developing resistance. Firstly this means not using the same type of herbicide repeatedly (especially not within the same year) – black-grass learns the code – instead, use a mixture of herbicides. Secondly, herbicides are just not enough. Cultural methods (meaning plowing, fallow and set-aside – for two years if possible) must also be used to some extent. The whole premiss of continuous winter-wheat cropping was to get away from the economic costs of those cultural methods. But look at those earlier figures about infestation and you can do the maths for yourself. Once the black-grass in a locality becomes resistant, it stays resistant, and then cultural methods are the only thing you’ve got left. The grasses along the edge of this nitrogen-enriched field are extremely impressive. Black-grass, Barren Brome and Italian Rye-grass grow gigantic and organ-piped, their tissues so sappy with nutriment that the stems snap like pea-pods when you pull at them. 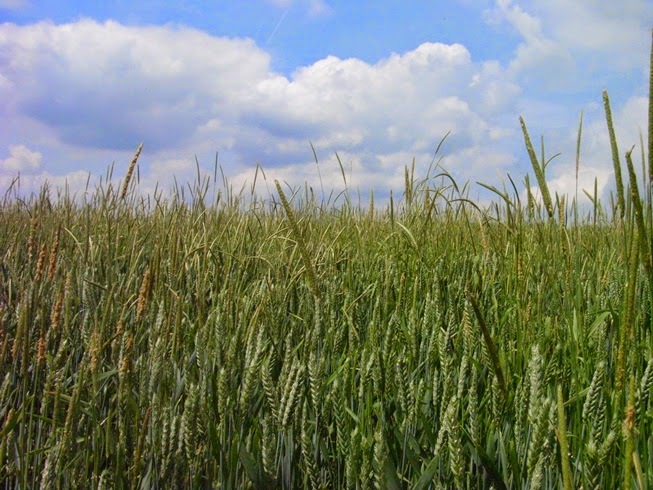 Italian rye-grass was introduced as a fodder-grass in the nineteenth century, but it has developed a vigorous second line as a wheat contaminant. In one part of the field it's taken complete control, its beautiful heads nodding and swaying over the wheat which is still sheathed.